The Polymath Chronicles: Happy Valentine's Day! My V-Day traditions are pretty simple - I like to eat a breakfast burrito in bed from one of my favorite places (conveniently named Valentine's), preferably delivered and shared with my Valentine, and I like to honor Amy Poehler's Galentine's by sending a sweet note to the ladies who make it work all year long. And bake. Love to bake, and love grapefruit - I have some grapefruit curd in the fridge right now! staying home and doing nothing is the best way to spend valentines day!!!!!!!!! I like to spend the day doing all the things I feel guilty doing on other days -- watching movies while putting off more important things, eating chocolate, staying up late and baking treats. Since Valentine's Day in New State tends to be cold -- this year, it's bitter cold, we like to bunker down inside and watch old movies, make a homemade pizza, and snuggle. We usually go out to dinner the day before or after, since the restaurants aren't quite as crowded. Grapefruit is hands down my favorite flavor. Unfortunately.I also have high blood pressure and take statins, so grapefruit is verboten. However I have been known to cheat with ruby red juice as I am weak and pathetic.Your recommendation of LaCroix water has encouraged me to seek it out as I already know I'm going to love it. For Valentines Day I took a lucious nap with my kittys and ordered some long underwear from llbean because it is -30 outside. I also ate a forbidden heart shaped donut given by a friend. Oh my gosh...MY favorite word is pamplemousse too! I swear! I buy pink grapefruit Method soap by the case because the scent was listed as...you got it...pamplemousse! Anyway...my husband and I don't really do much for valentine's day - usually just lunch or something simple. Today we went for brunch with my parents. My husband purchased the large nailhead-trim ottoman that matches our sofa! True love! Oh, and roses, there were roses! We made dinner together - sirloin, parmesan 'taters, and salad. I had given him some pecan turtles and he presented me with a mixed bouquet of roses and lilies. I think I first discovered you when you posted about La Croix pamplemousse some years ago...getting it delivered from amazon if I'm not mistaken. It's actually my anniversary on Valentines Day and my last name is Hart. Can you get any more romantic (and corny) than that? I knew I would love your writing as soon as you mentioned LaCroix Pamplemousse. My husband and I had our first date about ten years ago just before Valentine's day at a tiny local pizza place. Our 1st valentines as a couple a year later, I had to work that night and I came home to a heart-shaped pizza and angel food cake with strawberries. The next year we tried to go out and hated the crowds so we came back home and ordered pizza, that was when we decided to make a formal tradition of pizza and angel food cake with strawberries, which we've done every Valentine's day since! My husband and my first date was just before Valentine's day at a tiny pizza place ten years ago. The nect year I had to work Valentine's night and came home to a heart shaped pizza. The next year the crazy crowds kept us in and we ordered a last minute pizza. When we realized the trend, we made it official. Every Valentine's Day since we've had pizza and it's been such a fun, intimate tradition. Wine tasting (locally) and then a nice surf & turf candlelight dinner! Our tradition is to simply be together, and see where the day takes us, without stress or fuss. Staying home, watching movies all day is my favorite way to spend Valentine's Day..
From our wedding Anniversary on February 8th to Valentine's Day is known as "Love Week" in our house. And live means...Chocolate! So for a week we've been eating all kind of chocolates, cookies, chocolate covered pretzels, and crepes with Nutella (of course). My jeans might be a little tight next week, but my heart is full of love and happiness. But my stomach could do with some La Croix right about now 😊! I made a fantastic special dinner and dessert for myself and made sure I had some pretty fresh flowers for myself. I love peonies. I also went to my favorite yoga class and took a relaxing bubble bath. So, basically self-care and self-indulgence. Hanging out on the couch watching TV and making a good dinner! My husband and I had dinner out at a fancy steakhouse in our town. Which was no small feat since we needed a babysitter and my daughter is right in the middle of her separation anxiety phase! We exchanged cards over appetizers and I cried in the restaurant because it was so sweet! My husband coaches high school basketball so I am often at a game for Valentine's Day! My husband and I honestly prefer to stay in and order takeout or cook a yummy meal ourselves. And now that we have a three-month old, we.love staying in as a family! My husband and I take a 7.5 mile round trip hike (with our beloved Chihuahua Trixie) to the top of the Verdugo Mountains near the L.A. Basin. Once there, you can see the ocean and the Catalina and Santa Barbara Islands to the West along with Downtown L.A., Griffith Park, Hollywood sign; and to the East, North and South, you see a total of 7 different mountain ranges. It's the most magnificent thing I've ever seen in my entire life - especially in the middle of so many big cities. We pack in gourmet sub sandwiches and treats and have an amazing picnic under a shady pine tree with a bench at the top. It truly feels like you're on top of the earth and straddling two totally separate sides of it. I write this at 3 a.m. at the end of a one of a kind day. Our two-mom family spent our V Day visiting my ill father-in-law at the hospital an hour away. The five and eight year old girls bickered in the back as we slugged back home through a snowstorm. We ended our idyllic holiday with my wife cleaning up puke from the littlest's bed as I get her in a little nest in our room. As my wife and I collapse into bed, little one says, "I hope you had a great Vawentine's Day." "Oh. Uh. I hope you did, too, honey." My love and I ended our day by holding hands and shaking with silent laughter at the craziness of it all. Yup. She's my Valentine, alright. 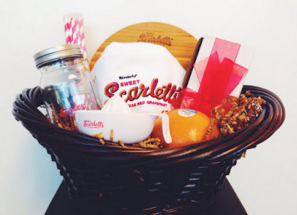 Valentine's Day is celebrated by spending the day together and having take-out or cooking a delicious meal. Spent at home with a good meal, cooked together and a really fantastic dessert. I'm not a fan of Valentine's Day. For that matter I don't like Mothers Day, Fathers Day or any other similar holiday. I much prefer to show the people I love them every day rather then when a calendar tells me too. I actually had one of the most fun Valentine's Day last night. My office is working with Indian based computer programmers. I actually had to go to India in Nov to meet with the programmers. Two consultants (one of whom i worked closely with in India) are in the states. They have been living in a hotel for months and they were both dying to cook. And I was dying to learn how to cook indian food. I invited them, and a co-worker and his family over for dinner. His daughter ended up getting sick (and had head lice) so her and her mom couldn't come. The lice freaked me out, so I made him and his son wear hats at my house. They had to stop off at Big Lots to buy hats and ended up getting hats in the St. Patrick's Day isle (which they wore the entire night). I couldn't stop laughing every time I looked at them. I was the one girl surrounded by 5 men. We used pretty much every pot I owned. My house still smells like curry, but dinner was amazing! As I dont yet have my own Charming Suitor, I have dinner with other single friends and we all enjoy each other's company! We watch a movie and eat pizza. The movie is generally an action movie from the 80s-90s and this year the pizza was homemade. I don't have very strong feelings about Valentine's Day but I like that we take the time to hang together. As a teenager, I longed for candy in the beautiful heart-shaped box, but that was in the bad old days, when a proper Valentine had to come from a man. A man who read my mind and knew what I longed for. It was a happy day when I realized that all I had to do was ask, or even better, buy it for my own damn self! Now, one of us picks out the box, but we wait until the day after Valentine's Day, when we can get a cheaper or larger box. I love that damn candy! Each year we write each other a card to open the following Valentines Day. It includes wishes for where we want to travel, buying something for ourselves, and then something silly. We look forward to it every year, and it's nice to "visit " with our last year selves. My friends and I have a "SAD" celebration (singles awareness day) where we bring bottles of wine, make dinner, and sit around and tell stories all night long. We instituted this a few years ago, a way to remember that love exists in many forms, and across many years. We typically make plans to go to a great restaurant, just the two of us, and then come home to drink lots of champagne on the couch and watch movies. It's a pretty great combo - some time to be out and about and feel a little fancy, followed by yoga pants and couch time. Does it get better than that? My husband and I are not romantic and we're fine with it. We do acknowledge daily that we still love and want to be with one another while everyone around us seems to be having a midlife crisis. Valentine's Day only gets celebrated with a card and a kiss while the teenage daughter rolls her eyes. First of all, PLEASE... I am waiting for a new book from you.... Please! In 3 years, we will have an empty nest and have to figure out something new! 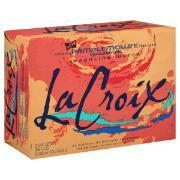 We are addicted to La Croix and pamplamousse is my favorite!! You are so lucky to be traveling. Such a luxury! My husband and I used to make a Valentines Day dinner together, but now with two little ones we don't have the time to make it a fun evening event. Now a bottle of wine and some Manchego cheese is perfect time spent together on Valentines day. We know we will have more time to cook together in the future as the kids get older. Thanks for the great giveaway. Your books are wonderful, I love the characters and mouth water descriptions of food and recipes intertwined into the books.